The split plate of of spinach gnocchi and mushroom tortelinnin at Vetri. When Marc Vetri and his partners sold their burgeoning restaurant empire to Urban Outfitters for big money in 2015, one big jewel in the crown — Vetri Cucina — was not included in the deal. "Vetri was out because I could never do it," he said of the place where, in 1998, he and business partner Jeff Benjamin began changing Philadelphia's concept of Italian food. "I'll never be able to part with it emotionally." It was a relief because I feel the same way. No restaurant in recent city history has remained a labor of love and investment in the name of gastronomy like this intimate townhouse homage to alta cucina at 1312 Spruce St. And with Vetri and Benjamin both officially resigning from their roles at Urban Outfitters recently, it should remain the primary focus of their attentions — at least until their next project, to create a new Cucina in Las Vegas, kicks into gear sometime next fall. In truth, even with all his distractions, the Spruce Street original has never stopped gracefully evolving. Added in just the last few years: a luxurious second-floor show kitchen and dining room for private dinners and special pop-up events that have given an element of spontaneous accessibility to the limited nature of the 32-seat luxury dining room downstairs, where it still costs $155 just to sit down for the tasting-menu dinner. Among the upstairs experiments was a surprise pasta bar frenzy this fall, with a selection of $18 à la carte plates announced that same afternoon on social media that had crowds of hopefuls lining up down Spruce Street. Another pasta bar event will be announced soon, Vetri tells me. Another successful upstairs experiment was a recent series of sold-out BYOB nights. I attended one for $125 (service fee included), with current chef Matt Buehler and sous-chef Jacob Rozenberg cooking the multiple courses from an open kitchen as if it were a fancy dinner party. We milled around the cooks' counter for prosecco and hors d'oeuvres with 17 other guests, then adjourned to the dining room, where we feasted for hours beneath the bordello-red Murano chandelier on shima aji crudo over parsley root cream, earthy pizzoccheri buckwheat pasta with chanterelles, and tender braised beef shins over risotto turned a vibrant green with peppery pureed broccoli rabe, among many other delights. We did not leave hungry. Not far away was another of Vetri's most significant upgrades, a third-floor room where head baker and miller Claire Kopp McWilliams grinds all the grain for Vetri's extraordinary pastas and breads. Yes, Vetri employs a full-time miller. 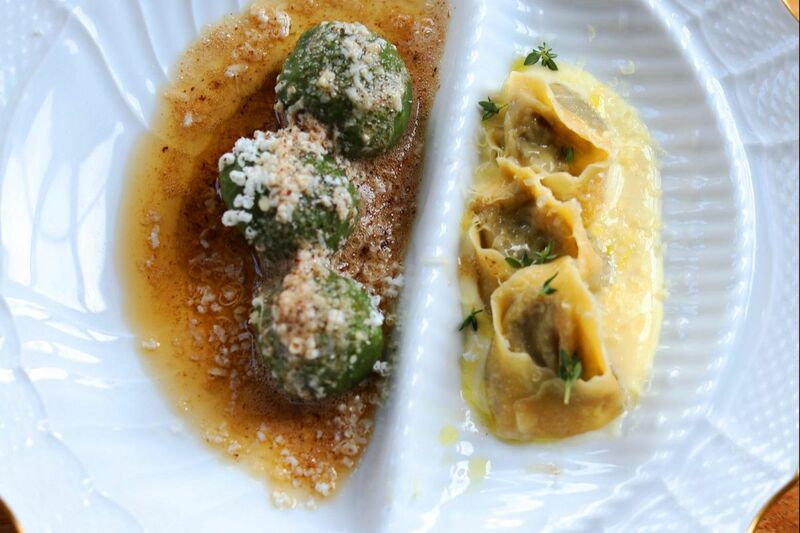 There have been momentary slips unbecoming of Philly's most expensive tasting menu, including a doughy period of too much flour in the famous spinach gnocchi — until the recipe last year was restored to its original airy glory. But over the years, this kitchen has largely continued to progress at an elite level. Vetri has maintained the classics (the rustic goat, the truffled-onion crepe, the yolk-oozing asparagus flan) while embracing more local ingredients (risotto rice from Jersey! ), while the menu glides easily toward contemporary and multicultural inspirations. Like the stunning smoked sturgeon with caviar and peas, or a crudo of tuna and pickled blueberries over sweet basil and melon puree. Or a Southern-inspired catfish tempura fried inside a jet-black squid-ink crust over a broth tinged with the ancient garum funk of Roman fish sauce. Or the Peking duck lacquered with maple and plum compote that was paraded through the dining room whole like the star of Vetri's $85 lunch, served every Friday now as a smartly abridged (yet still hearty) alternative for those who find the hours-long commitment of dinner too much. Either way, there will be exceptional (and pricey) Italian wines in grand or grander tastings to wash down every bite, poured by the warmest, most enthusiastic staff around. Benjamin's steady influence is felt there. And you're also likely to see chef Vetri himself, still doting on the restaurant that he kept for himself — and for the city that embraced him before national fame followed.